The Comfort Aire BHD501G Dehumidifier is a medium capacity unit that is effective in areas of up to 800 square feet or so. It is an energy efficient unit and is Energy Star® qualified. It has impressed users by being a little quieter than some other models and has a timer which offers more flexibility than those fitted by most manufacturers. Apart from a lower, 50 pints per day, moisture removal rate the BHD501G is identical to the 65 pint BHD651G. User reviews of both models are mixed with the main complaint being a short working life time, typically a couple of years. Despite these concerns the Comfort Aire BHD501G Dehumidifier is one of the better models sold in the USA but I would not say that it is the very best in its class. Although there are other models that are a little better the BHD501G is good enough if its particular mix of features matches your needs more closely. Auto-defrost is a feature that protects the unit from damage which can happen when the evaporator coils are covered with ice for long periods. It suspends operation of the compressor to allow the ice to melt. Although this feature does allow the BHD501G to operate in lower temperatures it will remove less water and cost more to run if used when the air is cooler than 65°F. This feature lets you set the level of relative humidity you need and the appliance will take care of the rest. It detects the humidity level in the room and tells the compressor when to switch on and off to keep the level stable. This prevents waste of energy and prolongs the life of the unit. There are two ways to dispose of the water collected. You can let it drip into the bucket and empty it away once or twice a day or you can drain the water continuously to a nearby drain through a hose you attach to a port in the casing. The Comfort Aire BHD501G Dehumidifier is a couple of pounds lighter than the 65 pint model but it still weighs as much as a sack of dog food. Handles at the top and casters on the base make the task of moving it easy enough for most of us. The lower fan speed is much quieter than the higher one and should be enough to keep humidity steady if you are using the unit in an area no larger than 800 square feet. The fan runs continuously on this model. As you would expect the BHD501G has electronic controls which are simple to use. The digital display shows you the level of humidity in the room and there are warning lights to prompt you to empty the bucket or to clean the air filter. When the filter has to be cleaned you will find that it slides out quite easily and can be cleaned with a soft brush or washed. This chore is essential if you want your appliance to perform well and to last a long time. This feature makes sure that a power outage does not stop the unit doing its job for longer than necessary. When the power comes back it switches the appliance on again at the last settings you keyed into the unit. The timer is a little more useful than the type fitted to most of the major brands and lets you set start and stop times over a period of 24 hours. The extra convenience this feature provides may be a reason to choose the BHD501G rather than one of the more popular models. The Green Warriors among you (I'm one too :) ) often ask about the environmental friendliness of any appliance. Although they can be a pain to get rid of when they die at least with this model you will know that it uses R-410A refrigerant which does not deplete the ozone layer. In their reviews users report that the Comfort Aire BHD501G Dehumidifier is quiet, that its electronic controls are easy to use and that the flexibility of the programmable timer is useful. Comments about build quality are mixed and the most common negative theme is that "Comfort Aire models don't last longer than two years". There are no complaints about effectiveness. All reviewers agree that the BHD501G is a hog when it comes to collecting water and that it controls humidity very well. Please note that some reviews still published on the Web are quite old and may not apply to the current model. Reviews written in 2010 or later are the most reliable guide. A word about longevity. The sad truth is that most portable models have a short working life. They are also "throw away items" because the cost of repair is usually uneconomic. By this test the Comfort Aire BHD501G Dehumidifier is neither better nor worse than other popular brands. Taking the last point into account I have no reason to steer you away from the BHD501G. If it was a little cheaper it would be difficult to argue against buying it. In a purely technical sense the BHD501G is as good as any of the better models out there and I would only choose between a Comfort Aire and another brand according to price and/or useful features. To summarize then; there is nothing to choose between the Comfort Aire BHD501G and other top brands such as Danby, Frigidaire, GE etc. Unless you need a particular feature, such as the timer on the BHD501G, I suggest that price should be the deciding factor. 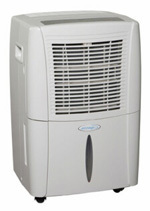 Having said that I can recommend the Comfort Aire BHD501G Dehumidifier to you as one of the better models you can buy.